Peter Huber of Wiener Neustadt, Austria, is a bottle collector and scholar. His interest centers around, but is not limited to, bottles which contain scenes of mineral mining. These bottles were made all over central Europe where mining was done, and some date from the 18th century. Peter has a wonderful website devoted to these bottles, called in German "Geduldflaschen," which translates as "patience bottles." He also has a list at his website of the earliest bottles of all forms, when they were made and by whom (if known), and where they are now. Many are in museums. He was lucky enough to find a broken mining bottle recently, and he has been rebuilding it. Click here to see this great work in progress! The rest of this page is an English translation of one of the pages at Peter's website. It describes the mining bottles and a monograph Peter and Otto Fritz wrote in 1995. Visit his website to see more pictures. 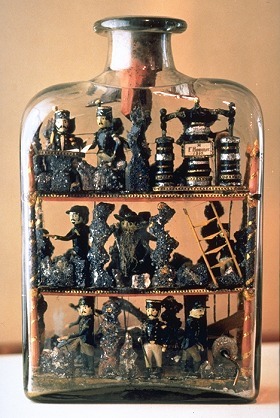 In May of 1995, as a result of many years of inquiries, Volume 27 of the publication of the Austrian Museum of Folk Art was published with the title "Mining Bottles: Contents and Spread of the Art Form from the areas of the former Austro-Hungarian Empire and the German Mining Districts", with a catalog of bottles (approx. 140) and fifty-three shown (photos or sketches)*. Left: Mining bottle from Kremnitz, Slovakia, first half of the 19th century. About 100 of this sort of mining bottles can be assigned to the lower Hungarian mountain towns of Schemnitz (today Banska Stiavnica) and Kremnitz (today Kremnica), eventually also from Neusohl (today Banska Bystrica) in today's middle Slovakia. More than half of these objects originated in the 18th and 19th centuries. All have in common a rectangular bottle form, and the furnishings or contents in most are in two to four levels. The lowest level contains scenes of ore-reduction with the ore output. The next level often has a wheel or winch bringing the ore up to the washing and smelting and making into coins. 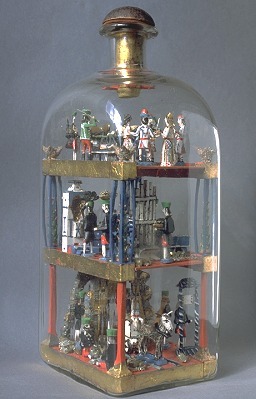 In the upper level is the portrayal of a mountain meeting or the mountain court, or an example of the maker's skill and dexterity, or a bell tower and religious motifs. Different building techniques and whittling details result in a typology of several categories. Some bottles contain statements of their makers and a date, and the oldest dated ones are from 1744 and 1751. For geographical assignment, the most important considerations are the minerals, the details of the construction, and the colors of the holiday costumes. Of the 36 bottles from German areas, most come from Johanngeorgenstadt in Saxony or Gottesberg in Vogtland, the latter usually signed and dated. They are frequently equipped with a movable crank, through which the carved miners or mechanical elements can be set in motion. These bottles generally are of rectangular shape with a relatively short neck and can be easily distinguished from the old Hungarian bottles from the manner of construction, the dress, as well as the frequent motif of a band of mining musicians on the top level. The Saxon objects can be traced back to the 18th century. More modern examples which show a circular cross-shape and a longer bottle neck are typical of the Harz Mountain area. The oldest mining bottle was made in 1719 by Matthias Buchinger who was born without hands or feet; it was found in Snowshill Manor, England. Another very old construction comes presumably from the old gold mine in Thuringia and has a miners motto and monogram that suggests a date of about 1775. In middle Slovakia and northeastern Hungary, also in Saxony, there are still some whittlers who continue the tradition. Our hope is that the present monograph* will stimulate the search for additional, as yet undiscovered examples of this charming and ancient branch of mining folk art.